An independent Vietnamese iPhone developer by the name of “Thuat Nguyen” currently has 42 of the top 50 books in the iTunes App Store “Books Category”. Most of these books/apps were released back in April this year and have little to no user ratings at all. Well then how are they dominating this iTunes category? It has been reported that a large number of iTunes accounts have been hacked, with as many as $600 dollars being spent from a single account without the consent of the account holder to buy these apps – hence making it to the top of the charts. 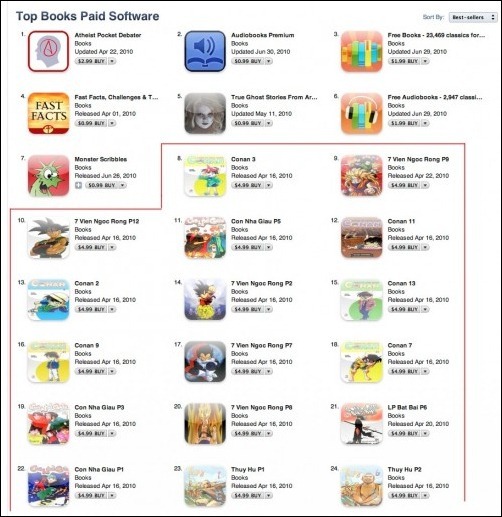 42 of the top 50 Apps in books category is dominated by one single developer. A small $1.00-$3.00 charge, then random navigation apps totalling around $190.00. Cancelled the card and now working with credit union to get the charges removed. I also received a receipt via email on my “Purchases” on 7/2/10. I made the mistake of storing my debit card on the itunes store app. I have run into the exact same responses that other users are reporting–only email as a method of contact. And this is not just limited to US based iTunes accounts only, some users from UK have reported similar problem. I’ve just noticed my iTunes account has been hacked in the past week. Someone has downloaded 8 apps and two songs totalling £61.70. The most expensive being an app called All Match by CharismaIST for £54.99! The other apps seem to be based on photographer like Camera One, Night Shot, Camera Flash Ultra. Surely Apple won’t pay out to these developers. I have changed my password and put in an email complaint to iTunes so we’ll see how it goes. 1. Change your iTunes Password as soon as possible. 2. Check your recent purchases history. If any suspicious activity has been found, report back to Apple. 3. Remove your payment/credit card details by setting the “Payment Method” to “None” until Apple has a fix to the problem. Thanks ! I just changed my password to something that is super complex and removed my credit card information. There is no App Store hack involved here that I can see, just some user accounts that have been compromised. Thanks a bunch for posting this… Just changed my info (password. etc…) Its funny (well not really), that Apple hasn't sent out emails to notify customers of this security breach in the App Store! Wow, they are really on a roll with the “looking the other way,” mentality aren't they?! It's so tough to deal with the communist in Vietnam. What are you going to do with that? Ban or bang them? yesterday I found out that my debit card was drained down to .26 cents. I am trying to gas up my car and machine message the merchant to call the bank immediately which was first time encountered in their store. When I called my bank, there was an unusual charges in Dubai, within 6 hours all the funds were exhausted. It almost gave me a heart attacked. Everything is taken care by the bank but hassles of waiting to get it back. Nice. I woke up this AM to a series of charges, totaling $175 (five separate transactions) out of my PayPal account. I believe I have now stopped them by calling PayPal and canceling a billing agreement with iTunes that has been on file with them since 2006! There were actually only four charges for approx $130 dollars when I called them. While I was on the phone w/ PayPal another charge came through!!!! WTF. She canceled my billing agreement with Apple one minute later and since then they seem to have stopped. They were coming two per hour for a couple of hours. It has been a few hours and no more have come through. Bull crap to the person who said Apple servers weren't hacked. There is no way anyone could access my account otherwise. I have taken a billing method off file with iTunes and changed my Apple password as well. This is total crap. And, because it was charged through a freaking “billing agreement,” according to PayPal, from 2006, I have no recourse and am out the money. I hope someone files a class action against apple for this crap. I am so furious right now. I can ill afford to be out almost $200 and from all the other people I have found online who this has happened to (all within the last month), Apple is not being very helpful in resolving the issue and refunding monies. They just say dispute it, but PayPal says I can't “dispute” since it wasn't on my PP debit card. I am about done with both of these companies! August 19, 2010 Same thing happened to me this morning. Charged through Paypal for a $50 “gift card’ on iTunes. Filed unauthorized transactions with both, changed my password and security questions on both and cancelled pre approved billing between iTunes and Paypal on both. Hope that does the trick and that I get my money back. Looking online i see that this has been going on for years and no one on either side has warned their clients about it. Looking for a good alternative to iTunes! Wonder if Apple ID’s were compromised so changed that too. Took all day to take care of these changes and i read that iTunes gift cards are selling like hotcakes on ebay for cheap prices, sure get them for free and sell them on ebay. Ebay and Paypal are the same company…hmmmm!! !